School's almost out and summer's just around the corner! Are you excited? I am, although I'm not really looking forward to the 100+ degree days that are typical of Austin summers. Thank goodness for swimming pools and air-conditioning! Anyway, in honor of summer, I've got a fun freebie for you - a set of 10 12x12 inch patterned papers in bright and cheery orange, aqua, red and blue. I downloaded these patterns for free from Freepik. If you're not familiar with Freepik, go check them out - they have tons of really awesome graphics that are totally free to download. Anyway, just click the image above to download. 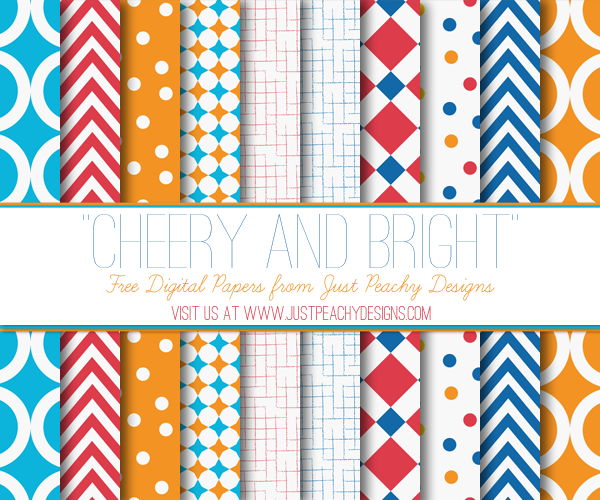 Feel free to use these papers for any scrapbooking, crafting and digital design projects. You can also use them commercially, just please provide credit to Just Peachy Designs and include a link back to this website. These are soooo pretty, I love all your printables, can you please guide me how we can create these. I want to create some and sell as well.